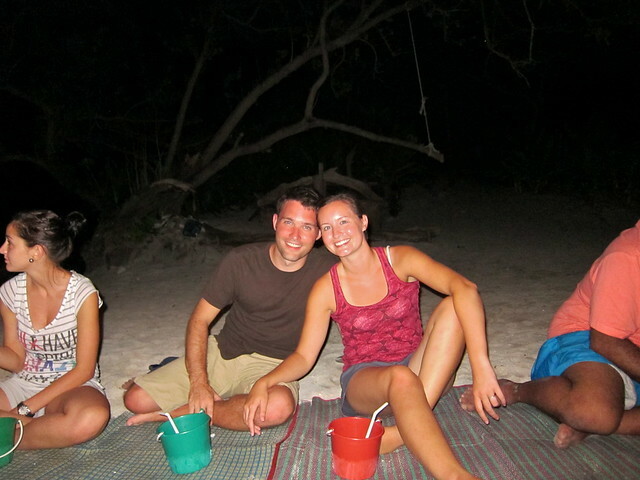 Camping on Koh Phi Phi Leh – snackettes. 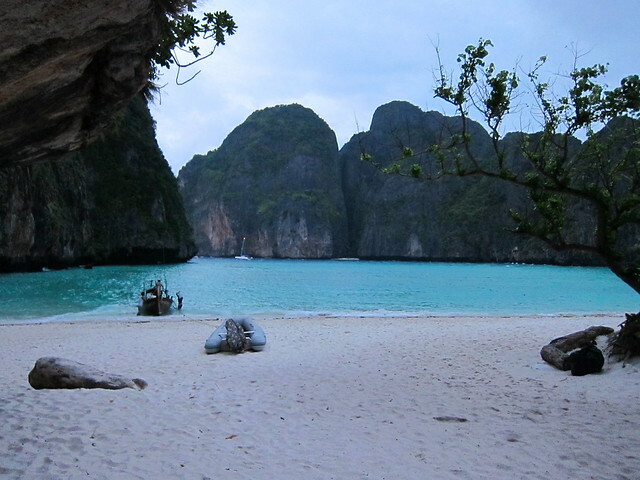 In our post about Koh Phi Phi Don, I’d mentioned an offshore detour we took on the 3rd night of our stay. 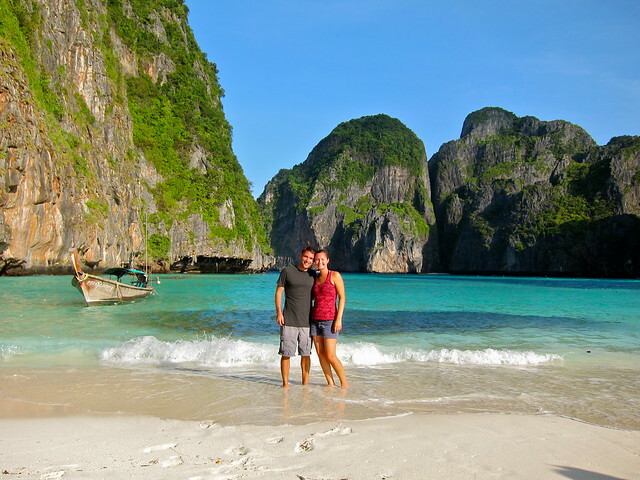 This was something we’d been really looking forward to… largely the real reason we went to Phi Phi Don at all, in fact! This “detour” was an opportunity to spend a night camping out on a beach on the neighboring uninhabitied island of Koh Phi Phi Leh. Unlike Phi Phi Don, “Leh” has no hotels, resorts, or even any inhabitants whatsoever save for the few rangers working to keep things in shape (it being a National Park). That doesn’t mean it’s not touristed though: it’s probably the single most popular destination in the area for snorkeling boat trips, and it can get a bit crowded during the day. Anyway, I’m told this island hasn’t always been this well known: it’s popularity was boosted significantly – for better and worse – when it was used for the set of the Leonardo DiCaprio film, The Beach: a book-turned-movie about an American backpacker in Thailand in search of the “undiscovered,” who winds up finding a tiny colony of like-minded transients living in a sort of planned utopia on this amazing protected beach on an island that apparently everyone else in the area knows never to visit! Of course, as they tend to do in scenarios like this, things end up all Lord of the Flies after not too long. Anyway, the movie has its warts, but it’s a decent story, and frankly, the scenery in the film is gorgeous. I’d be lying if I said we’d heard of this island before seeing the movie ourselves, and doubly so if I didn’t admit that the movie planted a little seed in our minds: wouldn’t it be amazing to see that place for real one day…? So, there we were, one island adjacent, and we’d found a boat operator through whom we could join up with a group of 20 or so people and cruise over to “the beach” and camp out on this island while it was entirely devoid of day-trippers – all for the cost of a night in a highway Motel 6 in the US, I might add – we were definitely doing this. After a close call with our prior registration potentially not going through (worked out fine in the end), we boarded the boat in the afternoon and met our fellow campers and hosts. There were less than 20 of us in all, including our two guides who spoke decent English. 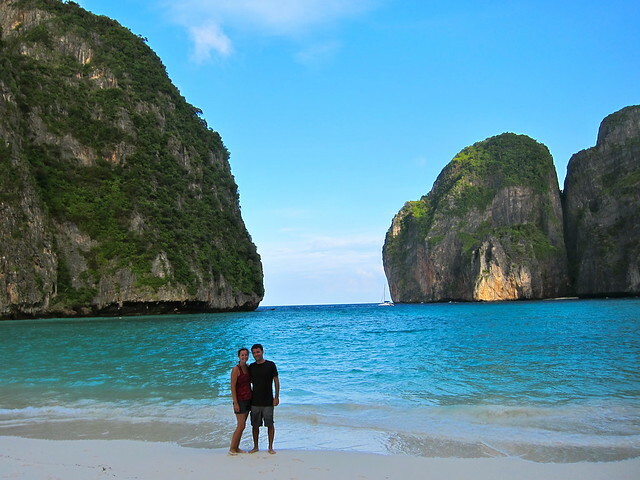 On our way, circling Koh Phi Phi Leh, we stopped to discuss some sights. The first stop was a spot called Viking Cave, where we observed the grim lifestyle of groups of locals who collect the extremely rare nests that are made of pure spit by swallows that live in the cave and on its exterior. The nests are shipped to China where they’re consumed as Bird’s Nest Soup, allegedly one of the most expensive delicacy foods on earth – and like many foods whose consumption is hard to fathom, it’s considered to be an aphrodisiac. Anyway, the real story here is these people construct super-rickety scaffolding from thin bamboo and scale it to reach deadly heights where they can collect these nests. Needless to say, the work is extremely dangerous. To protect themselves with good luck, they apparently coat some area of the floor of the cave with buffalo skins (did I make that part up? I’m not sure…). Personally, I’d probably go with some sort of fireman’s catch net or a trampoline, but I’m sure they know what they’re doing. (You can see the people near the bottom right, resting between shifts I guess). 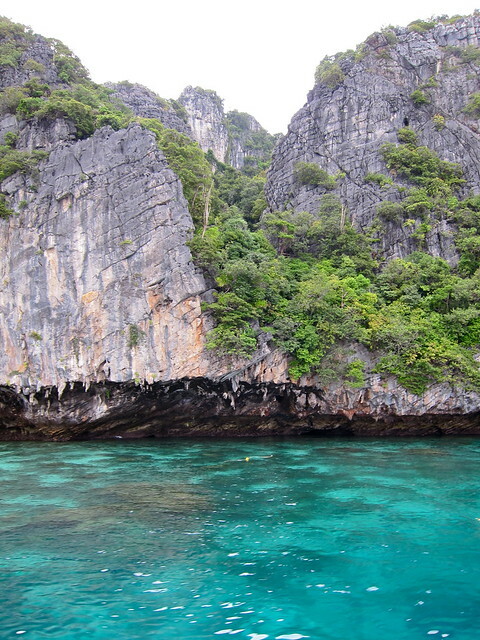 The next brief stop was a pretty cove where we could dive off the roof of the boat and snorkel along the limestone cliff walls of the island. 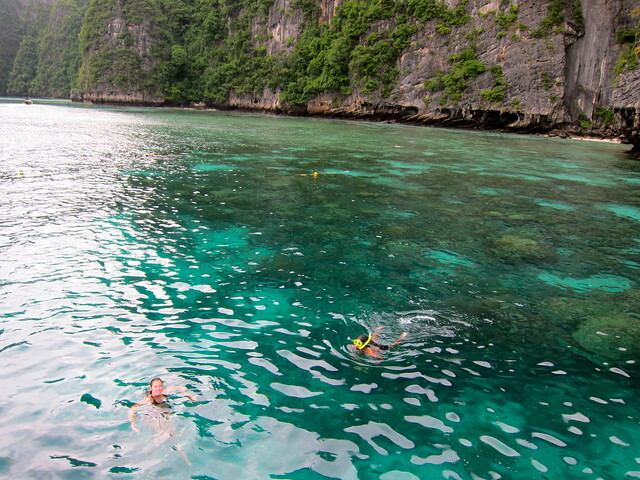 It was by far the best snorkeling area we’d visited in Thailand – an aquarium loaded with colorful fish and coral. 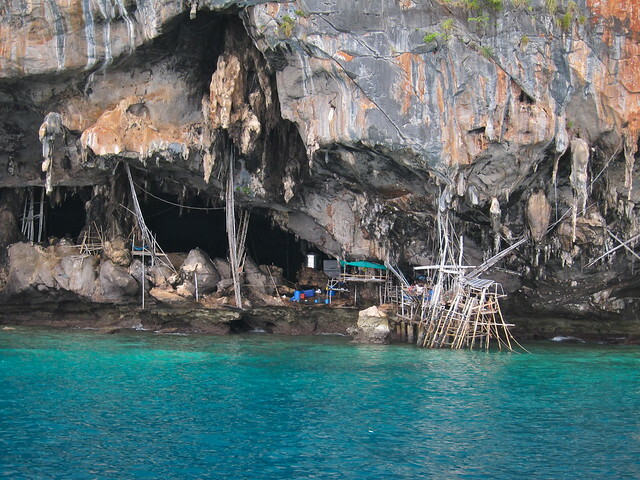 Moving on, we pulled around to a new cove on the other side of the island, and were told from there we should hop out and swim to shore, while the boat would stay parked there for the night (also, our personal belongings would be delivered by longtail boat). After that, the bushes parted to reveal this. It’s impossible to say how much a movie or book has affected your thoughts on a particular place after you’ve watched or read it. I’d like to believe that in this case, it had very little to do with the feeling you get walking onto this beach. It’s a truly special place. 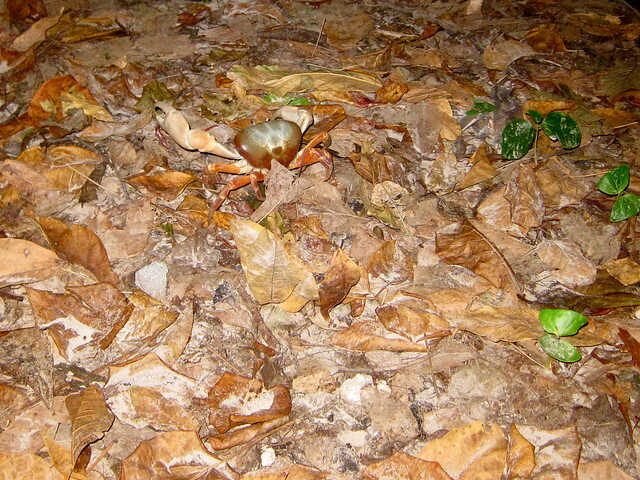 Late into the night, we went on a group excursion to the middle of the island where an apparently rare breed of crab lives in the woods. 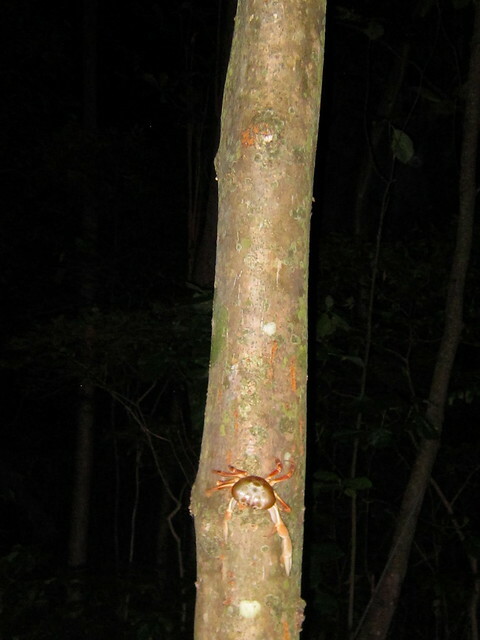 They were huge, they climb trees, and they’ve got natural camouflage! After that, Steph and I decided to call it a night and let our fellow drinking buddies continue on without us. After all, we came here to see the island! 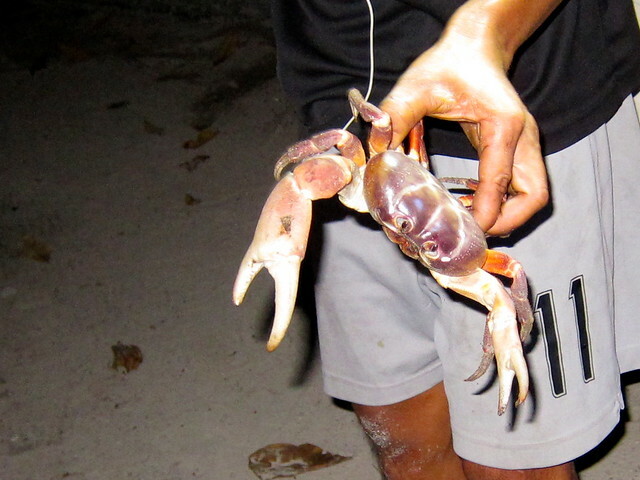 Our hosts provided sleeping bags and pillows, and said we had the pick of the island for where we’d prefer to sleep. Naturally, we picked a spot in the center of the beach, right on the sand! It wasn’t terribly uncomfortable, but neither of us slept a wink anyway. We just laid on our backs watching an incredible starry sky gain contrast over the center of this limestone amphitheater that surrounded us on all sides. After hours of star gazing, we never minded the lack of sleep; the place had the feel of a religious site. Eventually, dawn arrived. I snapped a few pics of our campsite. As the sun rose higher, we snapped some shots of the light on the rocks. …and when it cleared the rocks, the place just started to glow. We had breakfast and packed things up to leave, but not before taking a group photo or two. Lastly, an embarrassingly cheesy reference to the end of the movie, a jump shot. But, everyone was in too good of a mood to be bothered by such things. From there, we hiked and swam back to our boat, and we were off: one brief snorkel stop on the way again (where Steph mustered the courage to jump off the boat roof! 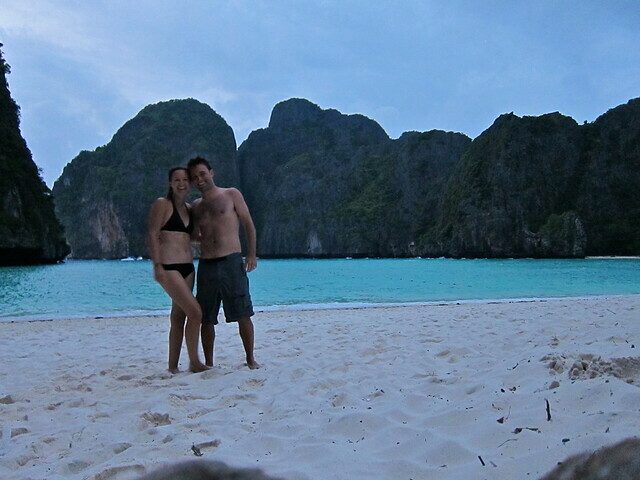 ), and we returned to Phi Phi Don. Tag this one as a highlight, it won’t soon be forgotten by either of us. This sounds like a great trip, and after reading it we’ve decided to do the same when we are there! Could you describe how you are able to find these operators/this group that arranged this? Hey! This looks like an awesome set up. 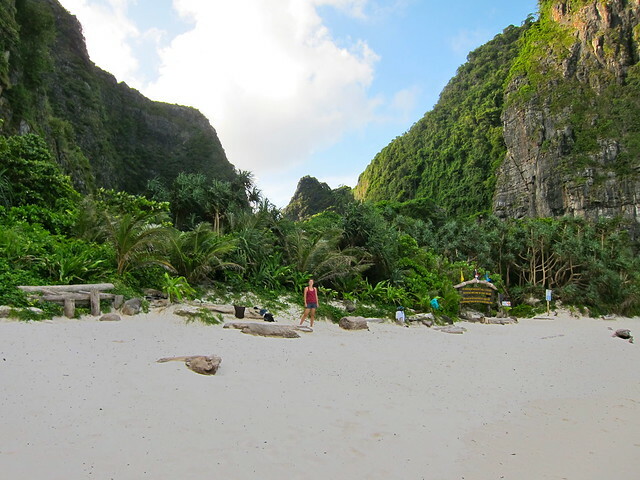 I visited phi phi don last spring, and will be returning in a couple of months. (Early DEC). I’m really interested in this. Can you give me a little info? What was the name of the company you went with? What was the cost in baht per person? This included meals? Did you book well in advance or not until you got to phi phi don? I remember seeing lots of companies in ao ton sai offering day trips, but I don’t recall overnight options. Are you camping by a tour. Can I DIY camping trip by myself? I can’t find any info abt this. 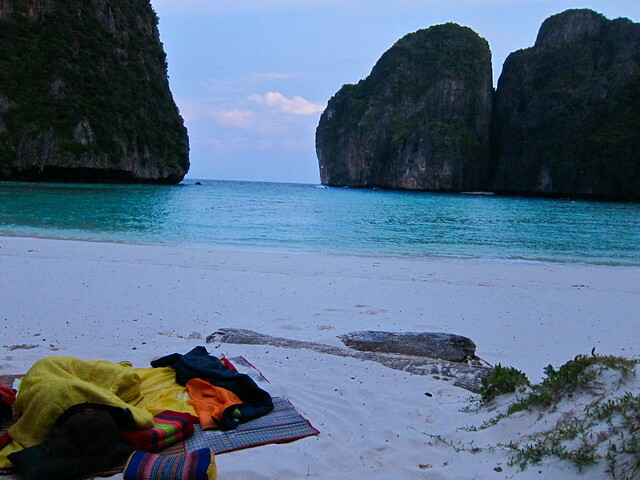 I just want to book the boat rounturn to get Maya beach then camping in my own tent. 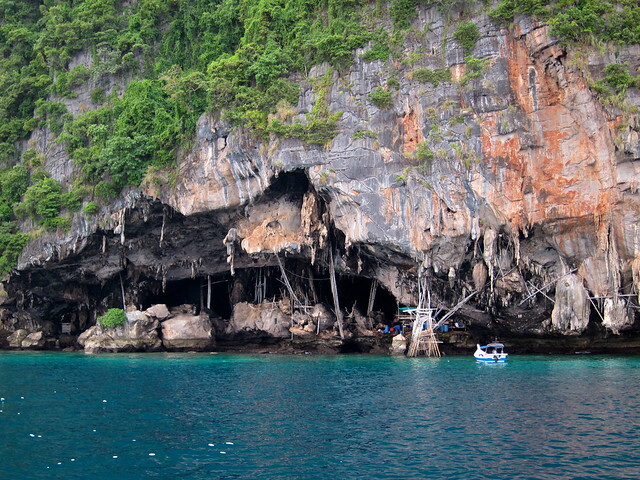 I’m going to Koh Phi Phi in march, and i want to sleep on Maya Bay. Which tour did you take?? Would your recommend any? 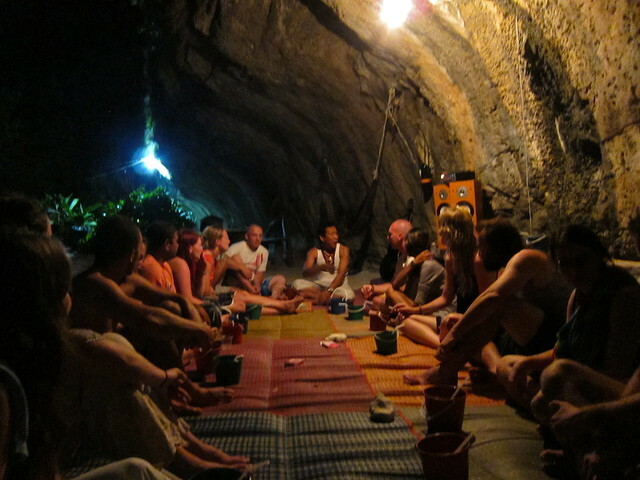 Although many commenters have asked about camping on Phi Phi Leh, we regrettably do not remember the name of the tour operator that took us on the camping trip. 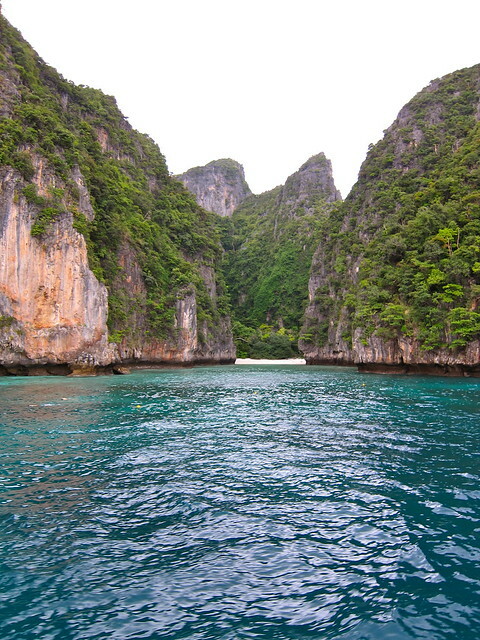 I believe they were the only operator offering such a trip, so I believe you simply have to ask around on Phi Phi Don. As one commenter asked, no, you can’t “DIY” camp on the island; it is a state park and camping trips are restricted to that one tour operator. I never been there, but planning to go there on Jan. I did some research and this is what I find out. Happy if the links turns out to be useful for you guys. And thanks a lot man for your information and awesome u took your time and effort to write this down.